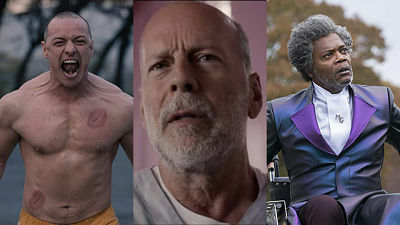 At the end of “Split” (and this now really isn’t a spoiler even if you didn’t see it), Shyamalan made an intentional connection to his 2000 hit “Unbreakable”, with a Bruce Willis cameo. He reprised the role of David Dunn, eager to search for McAvoy’s Kevin Wendel Crumb – the man with the multiple personality disorder who embodies 24 different people. “Glass” picks-up just a few weeks after “Split” left-off. Dunn and Crumb’s worlds intersect when they are taken to a Philadelphia psychiatric facility for evaluation. Dr. Ellie Staple (played by Sarah Paulson) is looking to see whether these two, along with Samuel L. Jackson’s Elijah Price (a.k.a. “Mr. Glass”) are actual “superheroes”, as the men believe – or simply normal humans with delusions of grandeur. The concept expands to incorporate comic book story structure and how people should be embraced for their differences. The most interesting storyline involves Casey (“The Girl the Beast Let Go” in “Split” – reprised by Anya Taylor-Joy) re-entering Crumb’s life. Unfortunately, most of “Glass” feels too forced and thinly thought out. The script lacks substance, resulting in slow and tedious pacing. It takes about an hour and a half before the actual point of the movie becomes clear (besides being a “Split” follow-up money grab). The screen time among the three main characters is not shared equally. Halfway through you will wonder, as I did, why the film is titled “Glass” when we’ve barely spent any time with the brittle boned genius. But, in the end, it’s Willis who draws the short straw when it comes to screen time. It’s clear Shyamalan’s intent was to create another showcase for McAvoy’s popular Beast character. And that’s what we get, along with the director’s trademark final scenes revelations. But the technique just doesn’t work this time. Stagnant, stale and stiff, “Glass” shatters any hopes of a powerful, intense and worthy conclusion to this unconventional superhero trilogy. On The Official LCJ Report Card, “Glass” gets a C-.